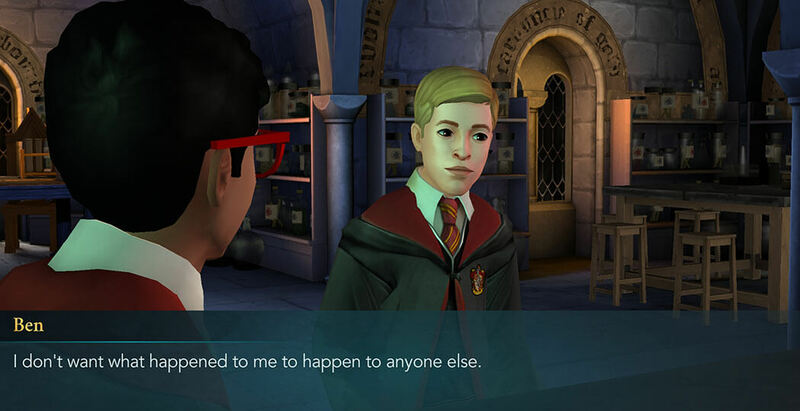 Ben is one of the most fearful and innocent characters you will meet in Harry Potter: Hogwarts Mystery. You will first see him hiding around the Gryffindor Common Room. Right from the very start, you can see that he easily gets scared, but also, if you assist him in any way he will appreciate you and he will always want to return the favor. Ben Copper is a Muggle-born, meaning he doesn't have any relatives that have any connections with the magical world. He was born and raised in Great Britain. Being a Muggle meant that he had a hard time facing other wizards. When someone wants to mock a Muggle-born they call him Mudblood, which will happen to Ben on a few occasions while attending Hogwarts School of Witchcraft and Wizardry. Because of his nice personality, Ben was sorted into the Gryffindor house. Chapter 3: Ben approaches you so he could show his appreciation for your bravery in standing up against Merula Snyde, the main school bully. Merula was torturing poor Ben and calling him Mudblood every time she could. He will also say that he was following her around so he could know where she is going so that he can easily evade her and her never-ending torture. Later in the same chapter, while you were going to attend your first flying class, you foundBen outside the Hogwarts Castle in the Training Grounds. He will approach you and say that he is terrified of flying, which will lead to you assuring him that everything is going to be all right. Ben realizes you are one of his few friends who really cares for him, and invites you to have a little talk while having lunch in the Great Hall. Chapter 4: While having lunch with Ben in the Great Hall you will discuss his fears, where you will yet again assure him that there is nothing to fear and that Hogwarts is just a big and exciting adventure. Chapter 5: In this chapter, Ben will encounter the full wrath of Merula, she will threaten him to leave Hogwarts and the wizarding world. She has a disgusting opinion on wizards that areMuggles, just like Ben Copper is. He is going to stand helplessly surrounded by other students with no one wanting to interfere until you arrive to save the day. Chapter 7: Ben will show his appreciation of you at lunch, where you will talk about his fear of flying. He will look at you as a big brother mainly because you were acting like one, constantly watching over him. After a few days of talking and assuring Ben, you will finally raise his confidence and diminish his fear of flying by casting Leviosa Charm and proving to him that there is nothing to fear. When he finally calmed down and gathered the courage he needed, he attended the next Madam Hooch's flying class and learned the first steps to fly a broom. Chapter 8: Ben will get his first task when your protagonist asks him to help in your rebel adventures in search for the Cursed Vaults. Having low self-esteem, he was unsure if he could even help, but he once again gathered the courage he needed and went off to practice his charms in order to be ready for the upcoming adventure. Chapter 9: Ben finally proved that he can be a good ally when he gathered the little courage he had and went with your protagonist and Rowan Khanna in order to search for the locked door and reveal the secrets that lie there. The second year doesn’t start too well for poor Ben. He goes missing on the very first day back at Hogwarts and no one knows where he is. Chapter 3: In the beginning of Year Two, you and your friends notice that Ben is missing. Your efforts to gather any information about his whereabouts end unsuccessfully and later you turn to Professor McGonagall for help. You finally find Ben in Chapter 3 in the Corridor, frozen by the Cursed Ice. 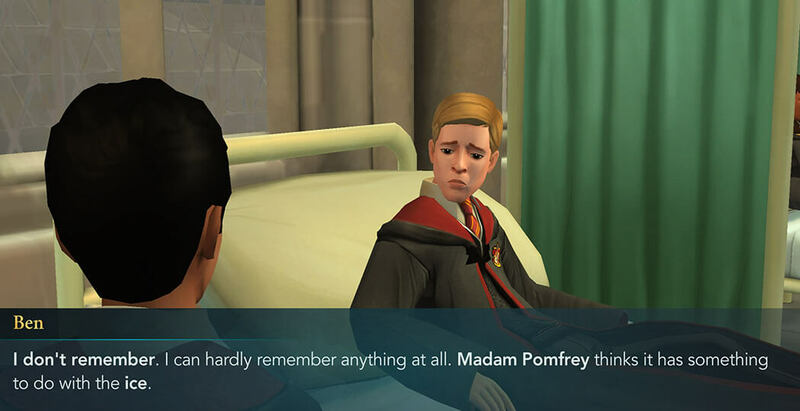 You and Penny are unable to do anything about the situation since professors McGonagall and Snape are already there. Luckily, they manage to free Ben successfully and he is then transported to the Hospital Wing. Chapter 4: After his encounter with the Cursed Ice, Ben was left unconscious. He doesn’t remain in that condition for long though, as he wakes up in the next chapter. You go to visit him immediately after learning this and ask Ben whether he remembers anything from the incident. Unfortunately, Ben is unable to recall anything. The ice must have tampered with his memory. Chapter 8: You are determined to go back to the Cursed Vault entrance and learn its mysteries. To ensure that the raid on the Cursed Vault goes well, you help prepare all your friends for whatever dangers might be waiting ahead. Ben wants to learn how to brew the Healing Potion, so you meet him in the Potions Classroom and show him the process. Chapter 10: Due to certain complications, you had to alter your plan for invading the Cursed Vault slightly, and instead of all of your friends, you can only take one. 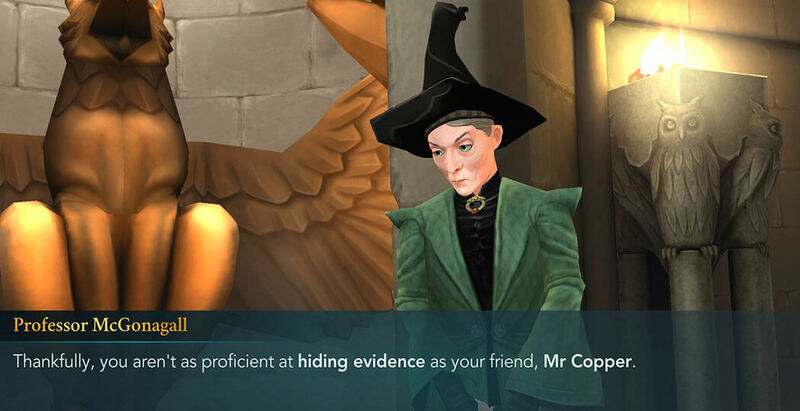 After the whole ordeal, Professor McGonagall will inform you she knows what you were up to and take away 50 house points from Gryffindor. If you choose Ben to accompany you on this adventure, he will make sure no traces are left and you can avoid this punishment.